I seriously thought long and hard about putting this post up. I really really hated this manicure, it barely survived a full 24 hours before I couldn’t take it anymore and took it off. I really really hate the shatter, but yet I keep using it. When going though my collection looking for polishes for Halloween, I knew I would do something with orange and black, but I’m not a fan of nail art. I don’t like having faces on my nails, or words and I really am pushing my comfort level with the magnetic polish. So I thought about doing an accent nail and in the end thought, well maybe the black shatter and orange polish won’t look that bad. I always think the shatter will work and look good and then when I actually use it, I almost immediately regret it. This is Zoya “Jancyn” with OPI Black Shatter. 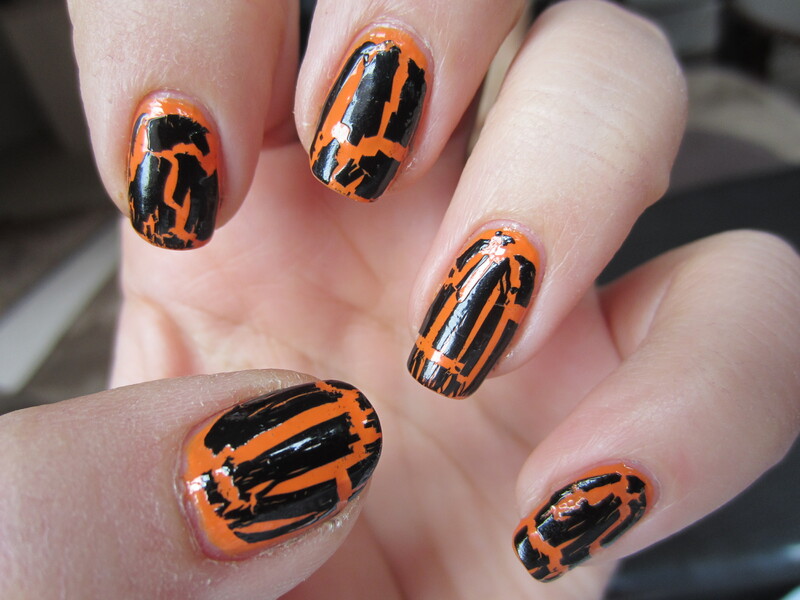 Although I think orange and black do look awesome for Halloween, that shatter totally ruined this manicure. I’m sorry if other people like the shatter, I know its really popular, but it is a trend that I can’t get behind. I have done some manicures where I liked the cracking nail polish, but the only time I’ve ever really liked the shatter has been with the white crackle from China Glaze or one of the silver crackles from Sally Hansen. But it seems as if the only time I like the cracking nail polishes is when the difference between the cracking color and the base color are minute. I liked the white shatter over a pale pink polish because from far away it just made it look like an even paler pink. I liked the silver shatter over a light blue because it made it look like a metallic light blue. But whenever I pair one of the crackles over an extremely contrasting color I end up not liking it. But enough of me ranting, I decided to put up this picture because I know there are still girls out there who love the shatter because OPI is still releasing new colors. So here is my Halloween shatter manicure, although I am not a fan that doesn’t mean someone else won’t be an get inspired to do this simple Halloween themed manicure. ← Serena Williams Glam Slam Set! Hey, your post was recommended to me by wordpress as I published mine about the same kind of manicure. Like you I can’t seem to get behind the shatter trend and my polish was removed only a couple of hours after I applied it. When I see shatter polish on other people I think it looks good but for some reason if I try it, it looks awful. Yours looks far better than mine but I went for the cheaper Barry M option so this may have been a factor. How cute! I love how vibrant that orange is! !